The enormous weights to be handled at ship lifting facilities are a big challenge for original equipment manufacturers. TEUFELBERGER high performance steel wire ropes are perfectly suited for use as hoist ropes in various facilities. 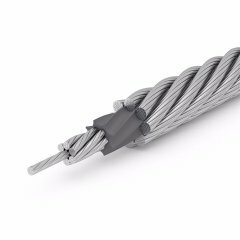 Our steel wire ropes, which are highly compacted by means of the special SUPERFILL® technology, are provided with a plastic-impregnated steel core ensuring safety and corrosion protection of the core throughout the rope’s service life. The even controlled elongation of the rope achieved by very close manufacturing tolerances makes the rope ideally suited for use as hoist rope (mostly used as pairs of left and right hand ropes) on shiplifter. On special request also high performance 6 strand ropes can be offered.